While workers in Aotearoa/NZ strike and demonstrate for improved pay and conditions from McDonalds, this struggle also has an international dimension. This report on an industrial campaign against McDonalds in Detroit, USA, is reprinted from Socialist Worker (USA). By Aaron Petkov, with contributions from Marie Bucks. MANAGERS OF the Detroit McDonald’s on Gratiot Avenue, northeast of the city center, discovered at 6 a.m. on May 10 that the restaurant was being picketed by about 20 striking employees. When they called other employees to come to work for a replacement shift, the other workers started arriving…and joined the picket line. The Gratiot Avenue McDonald’s stayed closed. That was just one of the stories from Detroit as more than 400 employees at fast-food restaurants across the city went on strike and took to the streets on May 10. Nationwide, this was the fourth such strike in the past several months–previous walkouts have taken place in New York City, Chicago and St. Louis. Since the Detroit action, workers in Milwaukee have also gone on strike. Throughout the day, workers and their supporters rallied outside chain restaurants like McDonald’s, Popeyes, Taco Bell and Burger King, gathering at the end of the day for a climactic march in the city’s New Center area. Like similar walkouts in other cities, the main demands of the coalition, calling itself D15, were for a raise in the minimum wage to a living wage of $15 an hour and the right to form a union. The strike was particularly significant for a city as devastated as Detroit. Over a quarter of the city’s families survive on less than $15,000 a year, according to the U.S. Census Bureau. Low-paying fast-food chains are among the largest employers in the city, with twice as many workers as the once historic auto industry. Over 50 fast-food locations across the city were affected by the strikes. Several locations were shut down or only opened the drive-thru. Managers at several locations attempted to keep their restaurants running by calling employees in to work on their day off. However, at many locations, many replacement workers joined the strike upon their arrival. This claim is laughable. Such lip service contrasts starkly with the actual experiences of their employees and other fast-food workers. One McDonald’s worker named Jay Robinson told reporters that when he started at McDonald’s over two years ago, he was paid $7.40 an hour. Robinson has gotten raises since then–and now makes $7.48 an hour. Robinson’s observation is dead on. The low wages that fast-food restaurants pay are a big reason why the companies rake in exorbitant profits. They’re among the largest businesses in the U.S. economy. Fast-food chains are expecting revenues of $200 billion in 2013. McDonald’s has already earned $1.27 billion in profits in just the first three months of the year. Total compensation for its new CEO came to $13.8 million in 2012. For the old CEO who was replaced in the middle of 2012, his total compensation last year was $27.7 million. David Novak, CEO of Yum Brands, which owns Taco Bell and KFC, among other chains, raked in total compensation $29.7 million last year. It would take the average Taco Bell crew member, working full-time and year-round, nearly 2,000 years to earn as much as Novak made in 2012. The demand of low-wage workers for a $15 an hour living wage goes far beyond what the politicians in Washington have put forward, even in rhetoric. During his State of the Union address, President Obama proposed an increase in the federal minimum wage to $9 an hour. While this proposal may appear generous, a full-time employee working for $9 an hour would only earn $18,000 a year–still below the federal poverty level for a family of three. Moreover, the proposal is still a step backwards from Obama’s 2008 campaign promise to raise the minimum wage to $9.50 an hour by the end of his first two years in office. He did nothing to make good that promise, even though Democrats controlled both chambers of Congress in those two years. Now, Obama and the Democrats are likewise doing nothing to honor the president’s State of the Union promise. In this context, the bold action taken by low-wage workers in the fast-food and retail sector is even more encouraging. THE STRIKES in Detroit, backed by a coalition that includes the Service Employees International Union and other labor organizations, comes at a moment of existential crisis for organized labor in Michigan. Last December, the Republican-controlled state legislature rushed through a right-to-work law after voters rejected a union-backed referendum last November to amend the state’s constitution to guarantee collective bargaining rights. The union drew tens of thousands to a rally in Lansing last December to protest the bill, but they were unable to stop it from passing. 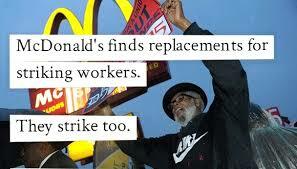 Detroit’s fast-food workers strikes are the first such strikes to occur in a right-to-work state. Detroit has also had an emergency manager imposed on the city by Republican Gov. Rick Snyder. The emergency manager has unilateral authority to restructure city services, finances and even labor contracts, with no oversight by the city’s elected officials. The potential, however, for actions by low-wage workers fighting for justice to galvanize the labor movement was well illustrated at the strike’s closing rally at the headquarters of the Detroit Federation of Teachers (DFT). The DFT was hit hard when former Democratic Gov. Jennifer Granholm put the Detroit Public Schools under emergency management in 2009. As a result, the DFT headquarters is largely abandoned and is up for sale. But on May 10, the energy of the hundreds of low-wage, unorganized fast-food workers and their supporters, marching and protesting after a long day of historic strike action, provided a hopeful contrast to the large, yellow “For Sale” sign hanging from the façade of the DFT headquarters.